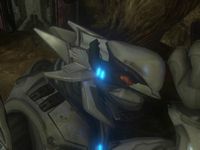 The Sangheili Helmet glitch is a glitch involving the helmets of various Sangheili corpses in Halo 3. At the end of the level, Floodgate, when entering the crashed Flood ship, the player will find several dead Elites corpses lying around. Some of them have a strange helmet that appears to be a mixture of an Assault helmet and a Combat helmet. It appears that the game had attempted to render both helmets on the head of the Elite, and thus both appear and overlap one another. This is reinforced by the fact that the Elites will have one Assault shoulder piece and one Combat shoulder piece. Some speculate that in the same crashed ship, bodies resembling Rtas 'Vadum appear randomly which happen to be wearing Combat helmets, and that Elites wearing an Assault Armor helmet appear randomly as bodies, which causes the programming to occasionally glitch and create a meshed version.